The Review Dog 2017: Orijen Dog Food Reviews – Made Under Experts Look Out! Orijen Dog Food Reviews – Made Under Experts Look Out! 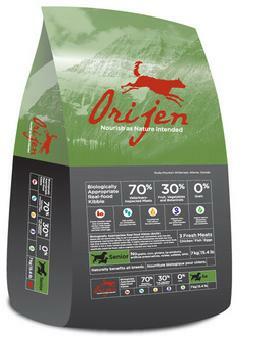 Orijen brand dog food is a wonderful option for the pet lovers to fulfill all required food supplements of their dog. It is made of with the all healthy ingredients that help in the better growth of your pet. Due to these reasons, Orijen brand dog food is going high on demand in the market in place of other dog foods only for its quality. Before all these things, the Orijen dog food has manufactured as well as supplied by the Champion Pet Foods. Due to huge demand and popularity this food industry has managed its special place in the pet food industries from last 25 years. This company was first introduced in Canada. This dog food is having the all sorts of food supplements that suitable for the better development of dogs. Orijen dog food has moved through several quality tests, so you can much reliable on this dog food to select for your dog. Now, many dry dog foods are introducing by the Orijen dog food manufactures in the market. Food manufactures are never using any sorts of harmful artificial color or food formation in their products, so it’s much suitable for your pet safety and better growth. Orijen Dog Food stands out by matching foods, which dogs evolved to need, thus giving an ultimate solution to the nutrition. They know that although our dog’s lifestyle has changed over centuries, digestive systems haven’t. Following the simple concept, the Orijen has made diets, which hold some distinct benefits. High Protein Sources – The dog's body is been adapted for the high protein, and low carbohydrate diets. Also, they are carnivores like you know and for this reason, Orijen diets have around 70% of meat. High in protein, various formulas give amino acids, which are necessary for the optimal health. Grain Free – Like stated earlier, the dogs are carnivores and they are not evolve to eat grains. Why they are in a lot of pet foods? The manufacturers & owners have to save on the cost & wanted convenient bagged items. The Orijen Dog Food will not use this practice. They know that grains such as rice are very high in the carbohydrates & contribute to obesity as well as other health troubles in the dogs. Dogs do not need carbohydrates and for this reason, Orijens do not use much.